It took Annie Murray 30 years to heed her calling as an animator. Now in the final months of her Bachelor of Fine Arts (Animation) degree, she talks about false starts, challenges, hard work, and her many inspirations. My pathway to the VCA started when I was one year old. That’s when the asthma attacks started. From that time into my early twenties I spent many, many years in and out of hospital, on the benches during PE, and off school when my class went on camps. It was a blessing in disguise, really, as I spent that free time drawing and developing my love of storytelling and appreciation for cartoons from my bed (think Ren & Stimpy and Teenage Mutant Ninja Turtles) and exploring films. I developed a passion for watching animation and drawing my own panel-strip comics, which usually entailed some kind of warped humour. I think when you’re faced with your own mortality from a young age you have no choice but to develop a dark sense of humour. When I finished high school I was offered a place to study archaeology at university, which I promptly deferred. I would have adored to have applied for something in the arts but I was far too unsure of myself and family pressure to choose something that would ‘make money’ loomed large. I then took a gap year … which lasted ten years. So much for making money – sorry Nana! I moved to Scotland in my mid-twenties and it was there that I bit the bullet and started illustrating comics for an online company called Popcorn Horror, a small film company that promotes grassroots horror filmmakers. It was the first time my work was shown to the general public and it taught me an invaluable lesson: don’t let the fear of rejection hold you back. If you’ve made something, show it to the world and see what comes back. In my late twenties I decided I couldn’t work another decade in jobs I hated. 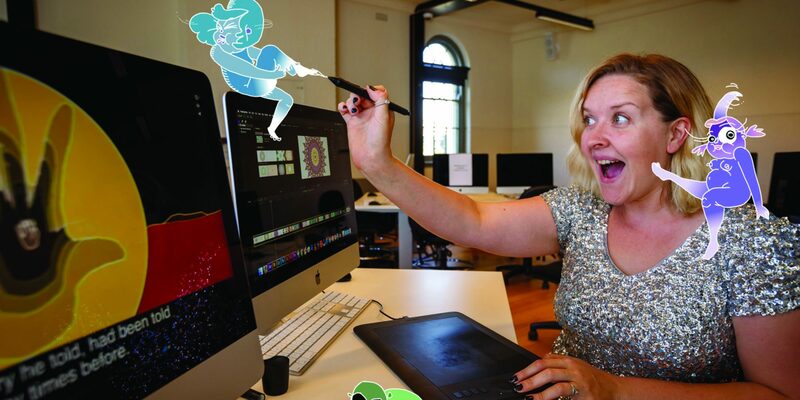 I desperately wanted to pursue a career in something I had always loved, and it seemed an obvious choice to me – a degree in animation at the VCA. I spent a year researching the establishment, contacting people and asking questions. I packed up my life and moved back to Australia to apply for the 2015 intake of students. At 30, I threw everything I had into applying for animation courses. I covered all my bases by applying to RMIT and other universities, but for me, VCA was the golden goose and I wanted to study there more than I have ever wanted anything. I submitted my application and hoped for the best but expected the worst. It was an insane feeling being accepted and every day I walk into the Margaret Lawrence building I feel a rush of pride to be among so many talented, inspiring and encouraging contemporaries and advisors. Secretly, I’m waiting for a letter from student admin saying it was all a mistake and that I should please leave now without making a scene, ma’am. Inspiration comes from everywhere. It could be the whispered words of a stranger on public transport, a voyeuristic experience, smelling something that reminds me of my childhood, the sound of cicadas, or the tiny patterns on the wings of lace-winged moths. I am inspired by so many things on a daily basis that it’s hard to keep up. I would advise anyone looking to build a career in the arts to carry a journal with them at all times. If you see something, hear something or feel something that could be the basis for a story or project, write it down! I have lost so many keepers because I have thought to myself, ‘I’ll remember that later’. I’m constantly inspired by my classmates, and by my advisors, Rob Stephenson and Paul Fletcher. They are amazingly encouraging, personable, charismatic and learned. I wouldn’t be here today without their support and kindness. Animation is a lot of work. Luckily, I very much enjoy sitting in a darkened room, frowning for hours on end at a computer screen. It’s an amalgamation of all things filmic. We need to know in depth how to take an idea from conception to final production and everything in between. When you apply at the VCA they want to see original stories and ideas – and they’ll teach you the rest. We learn directing, producing and editing. We must be storyboarder and cameraperson. We are our own lighting and sound mixers, colour graders and composers. We are the marketing, budgeting and promotional department as well as the animator. You really have to love this work. If you don’t, you will find it difficult to stick with. Pacing yourself and getting comfortable with schedules that are reasonable and attainable are skills that take time to learn, but are invaluable. You need enthusiasm and an open mind. What I love about my study at the VCA is the freedom it gives me to produce work to a level of which I’m proud. I’ve grown so much in my skill level as an animator and writer. I have been exposed to all manner of filmic techniques and animation styles which I probably wouldn’t have encountered otherwise. I also enjoy the networking opportunities. Recently, one of my very shortest films was selected by New York Film Week and received an official selection Laurel. The piece was a 35-second, abstract, stop-motion exercise that I created in my first month at the VCA. I find this hilarious – it just goes to show how subjective art is. That short film is nothing special in my opinion, but someone, somewhere on a judging panel watched it and it meant something to them. It may have helped that I titled it with an emotive name – You Are at First, Frightening – and banged a Nietzsche quote on it: ‘All great things must first wear terrifying and monstrous masks, in order to inscribe themselves on the hearts of humanity’. Without the skills and networking opportunities I have been afforded at the VCA, I would never have even got my foot in the door of a studio. The VCA teaches us how to search for work in our fields, shows us avenues we can go down, and teaches us how to impress prospective employers with our work. My life is better for having been able to develop myself as an artist, business woman and animator. I have made friends that will last a lifetime and think of my class as an extension of my own family. I’m not sure what the next few years hold for me. I’m considering doing an Honours year. But whatever happens I want to continue developing my skills and hopefully, much like a leech, attach myself to something bigger than myself and work in the creative industry. I’m ready to make some money and look forward to taking my skills into the workforce. OK, it’s advice time. Be inspired by others but never, ever try and be others. Be the best version of you that you can be. Go hard. Put yourself out there. Take risks – mistakes make great mates. Find out more about the Bachelor of Fine Arts (Animation). Banner image: Annie Murray in the VCA Animation studios. Photograph by Sav Schulman, animation by Annie Murray.